"What was it like? How'd you get through it?" The Orchard has released a trailer for an indie drama titled Outside In, the latest film from talented indie filmmaker Lynn Shelton (of Humpday, Your Sister's Sister, Touchy Feely). This first premiered at the Toronto Film Festival last fall, but it's also playing at the SXSW Film Festival next month, which is the perfect place because Shelton is a regular there. Jay Duplass (who co-wrote the script) stars as an ex-con who returns home and struggles to get back into normal life. He falls for his old high school teacher, played by Edie Falco, and they strike up a very unique bond that also challenges them. The cast includes Kaitlyn Dever and Ben Schwartz. This doesn't seem as comedic as Shelton's last films, more of an humbling, emotional drama lead by these strong performances. Take a look. After serving 20 years for the crime of essentially being in the wrong place at the wrong time, 38-year-old Chris (Jay Duplass) is granted early parole thanks largely to the tireless advocacy of Carol (Edie Falco), his former high-school teacher. As he struggles with the challenges of navigating the modern world as an ex-con, and with a fraught relationship with his brother Ted (Ben Schwartz), Chris ends up confessing his romantic love for Carol — a love that, given her marital status, Carol cannot reciprocate. Or can she? Carol longs for something her husband no longer provides. Meanwhile, Carol's daughter Hildy befriends Chris, finding a kindred spirit in this awkward, tormented older guy. 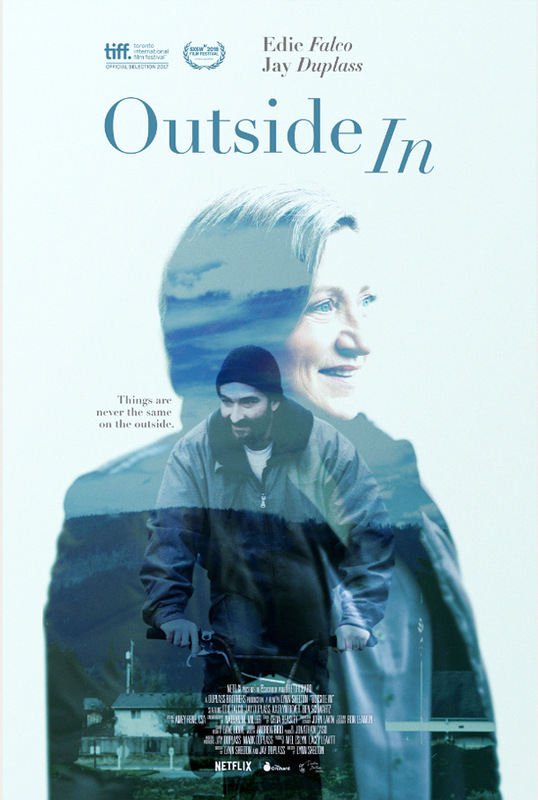 Outside In is directed by American filmmaker Lynn Shelton, of the films My Effortless Brilliance, Humpday, Your Sister's Sister, Touchy Feely, and Laggies previously. The screenplay is written by Lynn Shelton and Jay Duplass. This premiered at the Toronto Film Festival, and will also play at the SXSW Film Festival this year. The Orchard will release Shelton's Outside In in select theaters starting on March 30th, then on VOD starting April 3rd. Thoughts?